Typically, by the time a company has matured sufficiently to acknowledge the need for an intranet, the company has already made significant technology investments and a legacy platform is in place. Intranets have evolved considerably since their debut in 1994, changing from simple document-management systems to unifying business collaboration and communication solutions. Successful intranets bring real, bottom-line benefits to businesses—including improved efficiency, increased productivity, and satisfying employee experiences in today’s digital workplaces. Typically, by the time a company has matured sufficiently to acknowledge the need for an intranet, the company has already made significant technology investments and a legacy platform is in place. Previous investments heavily influence decisions to purchase new software for an intranet. Thus, UX professionals often have very limited or no influence on the selection of an intranet’s backend platform. How can you design a useful, usable, engaging user interface for an intranet when the backend is already in place? Focus on understanding the users’ needs and how best to help them accomplish their goals. The key to creating a successful intranet experience is to first understand the underlying needs of the users, then ensure that the intranet gets built with those needs in mind…. The key to creating a successful intranet experience is first understanding the underlying needs of the users, then ensuring that the intranet gets built with those needs in mind, and communicating with users throughout the process. UX designers and developers should kick off the design of a new intranet with a discovery process. Discovery gives you the opportunity to understand why your company might be experiencing user acceptance issues, usability problems, or a general decline in user satisfaction with your current intranet—or even the company’s capability to provide a collaboration and communications system. It’s critically important to get the discovery phase right. Otherwise, you risk failing to solve your organization’s problems by building the wrong solution. Nobody would start a business without studying the market or hire a new employee without first conducting a series of interviews. However, many organizations initiate an intranet project simply by licensing a software product, setting up security and governance, and declaring victory. They bypass the most crucial part of the process—discovery. The discovery process starts with stakeholder workshops, user interviews, a walkthrough of any current intranet, and getting an overview of its known pain points. Upfront user research is essential to gathering solid user insights and understanding users’ underlying needs. This includes discovering the context in which the intranet could serve as a key resource that would help elevate the work experience. Find out how users would prefer to learn or get training on the new system. Discovery also provides a solid understanding of your organization’s internal processes and operations and determines how you should measure success in terms of key performance indicators (KPIs). Help your organization to understand why issues are occurring and use your key learnings to create a plan to get the organization back on track. The UX-design process provides a bridge between your organization’s business requirements and technology implementation by keeping the focus on the user. Your research can guide the selection of the correct features and functionality that would meet your users’ needs. Ensure that you have the internal structures, resources, and processes in place to get your intranet launched and adopted successfully. During the design phase, your organization might want to consider whether the intranet should serve as a portal—that is, a single user interface that centralizes access to content, data, and key tasks. A portal typically brings together the existing third-party and internal applications and tools that users need to fulfill their daily job functions—for example, human resources (HR), payroll, or time- and expense-management systems. If your firm wants to build bridges within and between groups across the company, a portal could be a good option. You must configure the features and set up a taxonomy, terms, and content types that map to your organization. The better you understand the users’ mental models, the more successful your intranet implementation will be. With a clear plan, a well-defined set of features, and an expert UX team, you’re ready to proceed to the build phase for your new intranet. You can either build the intranet from scratch—by deploying an enterprise solution such as SharePoint—or use a headless platform, which comprises only a backend that organizes and delivers content, then apply a user-interface (UI) theme or custom UI for presentation. Whether you deploy an out-of-the-box instance of SharePoint or a headless solution, you can’t simply turn on all of the features and expect the system to succeed. First, you must configure the features and set up a taxonomy, terms, and content types that map to your organization. The better you understand the users’ mental models, the more successful your intranet implementation will be. A successful intranet requires clear, easy-to-understand information structures and consistent navigation that supports both browsing and search pathways. When intranets have a logical, easy-to-use structure, employees can quickly find what they’re looking for. However, these affordances are not built into the software your company purchased, which makes it difficult for users to find what they need when a company deploys the software out of the box. Building an effective, user-friendly business solution requires UX professionals who understand user needs and know how to harness the power of the backend system. Adding to the complexity, most organizations have large volumes of content and data, as well as differing user requirements. Therefore, creating a clear information architecture and adhering to a well-defined structure when building out the intranet are essential to its success. Without a clear structure and adequate metadata, many intranets become dumping grounds for disorganized caches of documents and data. This forces users to sift through heaps of information, using ineffective search tools. Information architecture refers to the way your content is categorized, labeled, and organized. Navigation refers to the affordances for and the process of moving from one place to another on a site. How can you organize your content and data to ensure findability and discoverability and provide a positive user experience? By creating a logical information architecture that matches users’ mental models and by providing clear navigation throughout your intranet. Tag all of your content and organize information in a way that makes sense to your users. Identify the key business concepts for the content, documents, and data on your intranet, then create contextual information artifacts that help people find what they want and need. Consider key aspects of what is important to users, how to better structure information or data to meet their needs, and how you can improve the information’s organization, the workflow, and access to the information. Can we put our own user interface framework in place? Can we create a headless solution and make API calls to the backend? Now, let’s look at each of the three flavors of intranet deployment in greater detail. 1. Leverage the out-of-the-box user experience of a packaged solution. Your enterprise technology platform or content-management solution (CMS) might include some useful features such as enterprise search, news, employee directory, personalization, team collaboration spaces, blogs, and wikis. Many businesses just license a product, set up security and governance, and think they’re finished. What they fail to understand is that they’ve just begun the process. A packaged solution is not immediately ready to use once it’s been installed. You must first customize the platform for your organization, by configuring features and setting up the taxonomy, terminology, and content types that map to your organization. The better you understand your users’ mental models, the more successful your implementation will be. 2. Customize the out-of-the-box experience with scripts, modules, and plugins that add or extend features. Surfacing community content outside the individual communities made it easier for people to find the content. For example, to create a seamless user experience for the U.S. 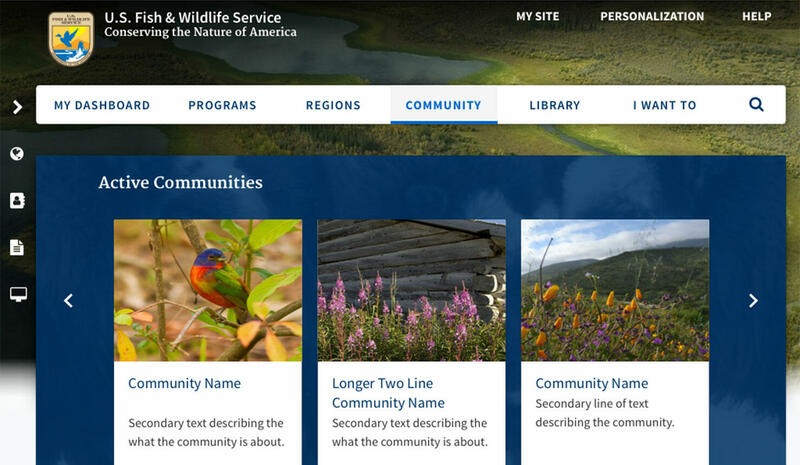 Fish and Wildlife Service’s portal, we harnessed SharePoint’s community capabilities to connect disparate groups across the organization. The agency’s in-house IT department and business managers did their best to leverage the out-of-the-box features, but the communities were not getting as much traction as we had expected. Surfacing community content outside the individual communities made it easier for people to find the content. Building a portal page provided a place for key discussions across communities. The portal also served as a directory, letting people know what communities existed and allowing them to engage with them. You can also leverage search to surface community content to other parts of the intranet. If you provide access to information and features in contextually meaningful ways, people will find and use them. It’s equally important to determine what content should continue residing in other systems. Whenever you send users to other systems, be sure to create a consistent user experience that makes the transition from the portal to other key systems as seamless as possible. Provide details that inform users about what they can do in the other system. 3. Develop the entire user interface, using APIs to communicate with the core intranet system. When building an intranet, you need to keep in mind that it will evolve constantly, along with the company, so leveraging a platform that is already part of that ecosystem is key. Determine whether it’s possible to use APIs to connect to the existing backend and create a new or separate custom user interface that leverages the capabilities of the backend solution. A potential issue with this third flavor of deployment is that, if the pace of changes to the intranet is high, the cost of maintaining this type of solution would be costly. In most cases, the intranet must be highly integrated with other existing solutions and software applications, so it’s better to select a platform that plays well with the existing ecosystem. When building an intranet, you need to keep in mind that it will evolve constantly, along with the company, so leveraging a platform that is already part of that ecosystem is key. The U.S. Fish and Wildlife intranet, shown in Figure 1, is based on SharePoint 2016. At the left is the community portal landing page, which has many positive attributes—such as a visually pleasing, on-brand design and simple navigation that makes it easy for employees to find the content they need. Our UX professionals focused on the users throughout design, build, and launch, making the intranet a useful communication and collaboration tool that employees have come to rely on. Getting internal users prepared and excited about using the new system long before it goes live is just as important as what you design and build into the solution. Of course, you shouldn’t wait until launch to start communicating about your new intranet. Getting internal users prepared and excited about using the new system long before it goes live is just as important as what you design and build into the solution. Inform employees about the new intranet initiative as early as the discovery phase, then keep them informed throughout the development process. If they know what’s happening, when the go-live date finally arrives, there won’t be any surprises. From early on, everyone should be educated on the value of the intranet, how the intranet will impact their day-to-day roles, and how it will improve their ability to communicate and collaborate with others in the organization. Using such a soft-launch approach provides opportunities for employees to provide feedback, which you can incorporate as the system gets built. This is why training should happen long before the launch of your intranet. When you’re developing your launch and training plan, connect the dots, leveraging the learnings from your user research during the discovery and design phases, when you discovered the types of training that would work best for the employees who will be using the intranet. Usually, the same type of training does not work for all employees. A multipronged approach to training works well and could include in-person training, online support within the application such as chat, and self-service tools such as FAQs and videos. 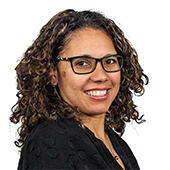 To increase the overall adoption and success of the new intranet, recruit internal champions or evangelists. These are the people who were most excited about and interested in the new intranet after the early user research. Have them conduct training for other employees rather than the consultants. By using the train-the-trainer model, consultants train the clients’ evangelists on how to use the system, as well as on how to train others internally within their own organization. This will prepare everyone for the change that is to come. Having these evangelists do the training and roll out the intranet ensures optimal knowledge transfer. As a consultant, you can rest assured that your client has employees who truly know the system. The U.S. Fish & Wildlife Service took an inclusive approach to ensure its constituents were informed about the progress of their new intranet. They held internally led workshops in each of their regional offices, sharing a prototype of the intranet prior to its launch. Senior leaders from the U.S. Fish & Wildlife Service led the workshops, presenting the core features, functions, and benefits of the new intranet to help employees get orientated to the new system. They invited the subject-matter experts who designed and built the intranet to answer employees’ questions, identify issues that they needed to address, and gain feedback and insights. They used video conferencing during the workshops and made video recordings of them for remote workers not able to be there in person. They later edited the video to include screenshots of the final intranet, providing a guided video tour of the intranet to use as a training tool and for onboarding new employees. Determining whether such a staggered approach to launching your intranet is appropriate depends on the scale of your project and the number of users. But, when using this approach, great fanfare on the go-live date is less necessary because your users have been informed about and trained on the intranet from the start of the initiative. Your intranet is an evolving, dynamic system that continually requires resources and investment. The employees who use the intranet on a daily basis can provide the best feedback on it. Once you’ve gone through the entire project lifecycle—design, build, and launch—you may think it’s now time to bask in the glory of your successful new intranet. Not so fast. The launch is not the end of your project. Remember the KPIs you decided to use at the start of the project? You’ll want to make sure that you do training in such a way that you can measure the success of the launch against those initial KPIs. For instance, if a KPI is to have 50% of the organization up and running on the intranet within six weeks of the go-live date, you’ll want to have a training plan in place that enables you to achieve this level of user adoption. Just like your business, your intranet is an evolving, dynamic system that continually requires resources and investment. The employees who use the intranet on a daily basis can provide the best feedback on it. Listen to them, communicate with them, and act on their recommendations to ensure your intranet remains a relevant and valuable tool. UX research and design can make a tremendous difference in the success and adoption of your intranet, regardless of the technology on which it’s built. As a UX professional, it’s your job to understand the users’ needs, then design the intranet’s user interface, keeping your focus on what users need to accomplish with the system throughout the project lifecycle. You can help your company to focus on the experience they need to build for their users.